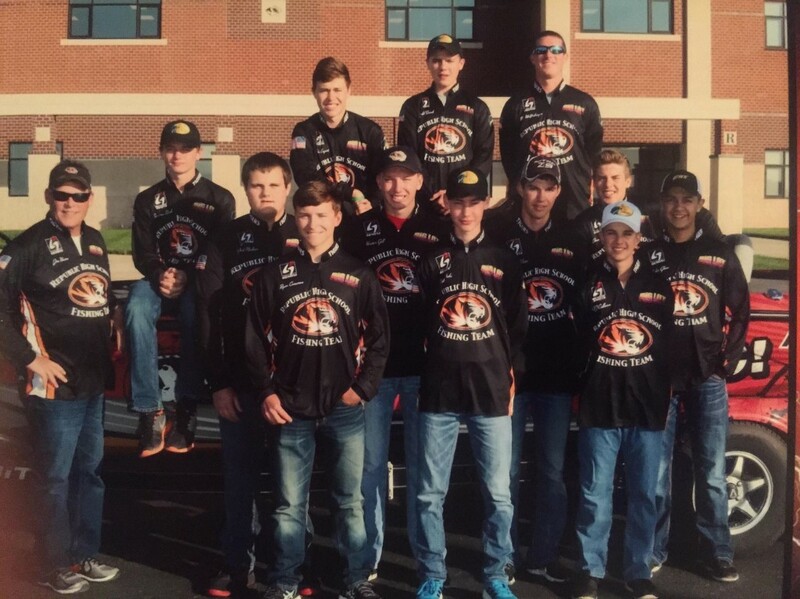 The Republic fishing team finished second at the Teen Anglers State Championship at Stockton Lake Sunday. Brandon Durr and Hunter Gill led the way for Republic, with a second-place finish and a final total weight of 21.87 pounds during the two-day. Republic’s Jase Houchin and Colton Mease finished fifth overall, with a total weight of 20.05. Nearly 80 two-person teams competed. Republic finished just 12-hudnredths behind overall champion Ozark, 21.99 to 21.87. All five of Republic’s teams had their five-fish limit on day one. On day two, because of the tougher conditions, only two out of the five were able to catch a limit. All five of Republic’s boats finished in the top half of the field. Cameron Beck and A.J. Calhoun finished 13th. Cory Lafferty and Jace DuVall finished 18th. Gerald Snook and Josh Perkins finished 30th. Durr and Gill finished the season in 8th place for overall points on the Missouri high school fishing circuit. Coach Jim Huson says their teamwork on the water gives them an edge over most other high school competitors. Durr, Gill, Lafferty, and DuVall are all seniors, which means Republic will have to replace a big part of its team next year. Huson says that will continue to get more difficult as competition improves. “It’s like anything. As more people are getting involved, school districts are finding those outdoor families and have parents who are engaged in fishing. We’re seeing the caliber of fishing skills really going up. School district are approving it. The level of competition has literally doubled this year across the state, and it’s going to get tougher and tougher every year,” he says. On Saturday, the first day of competition, all five of Republic’s teams caught their limit. Sunday, things changed. “Saturday, the fish were really going crazy. Everybody was biting,” says Huson. “On Sunday, the fish just wouldn’t bite. The deeper fish had made a move out to the next drop out to 18 to 20 (feet). That’s part of the mystery and science of fishing. You have to constantly adjust to your environment. Huson says that kind of on-the-fly adjustment makes fishing a far more difficult sport than most people believe.